Does my user name have to be the same as the office email address? No, you can create any user name and password that is easiest to remember for your office. 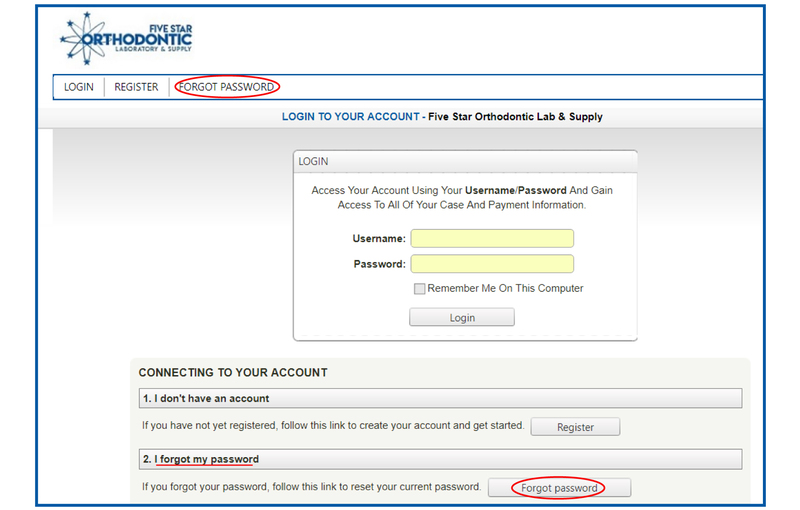 Do I have to have an account established with Five Star Orthodontic Laboratory & Supply before signing up for the Customer Portal? Yes, you can easily set up an account with Five Star by completing a New Account Form and emailing it to beth@fivestarortho.com. We will then contact you to complete your account setup. I have forgotten my password, how do I retrieve or reset my password? Resetting your password is easy, follow the steps below to get back into your account. 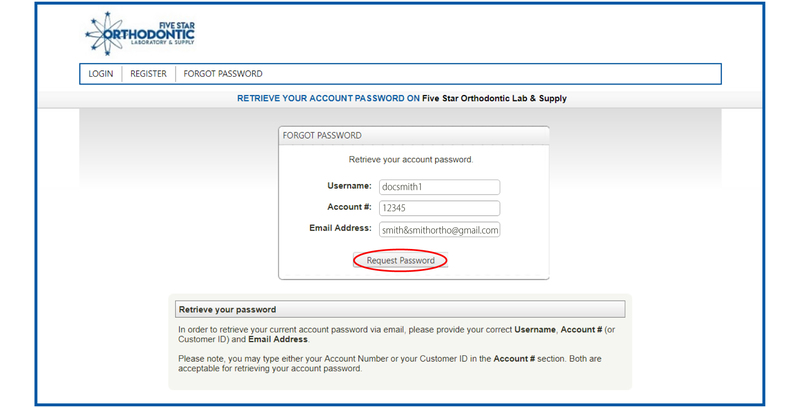 2) Enter your 'Username', 'Account # or Customer ID #', and 'Email Address' then click 'Request Password' at the bottom. 3) After filling in this information, click 'Register'. You will then receive an email with your password reset information. If you are still experiencing any issues regarding your Customer Portal account, please contact customer service. I am having trouble with the Customer Portal, how do I contact customer support? We are here to help! You can call and speak with a customer service representative at 800-521-2351, extension 222 or email support@fivestarortho.com. Our office hours are Monday through Friday 8am to 5pm CST.